This belief has driven how I respond to stressful situations throughout my life. When I was pregnant with our first child, I took every class I could find, read lots of books, and watched many hours of birth videos (thanks to my midwife sister). I learned and got ready. When I found out we were having twins, I read books and asked questions of every twin I knew. As the pregnancy progressed and took a complicated turn, we were told that the girls would likely be born severely premature and if they survived they would face a lifetime of challenges. In response, I started reading about raising children with special needs. I subscribed to blogs written by some amazing families with special children. I got prepared. When I was diagnosed with lung cancer, I dove into the research and tried to learn everything I could about this disease. Actually, that is not quite true. For the first few weeks I actively avoided reading anything about it. I knew enough to understand how dire it was. I couldn't face seeing it in black and white. Eventually, I took a deep breath and started reading. Gulp. Well, now I know. Now I will learn all that I can. So, THEN I started wading through journal articles that were way over my head, desperately trying to understand this thing that was taking over my body. One very interesting area of research is the driver mutations for adenocarcinoma. By analyzing a sample of the tumor, the doctors can sometimes determine what is causing the cancer to grow. 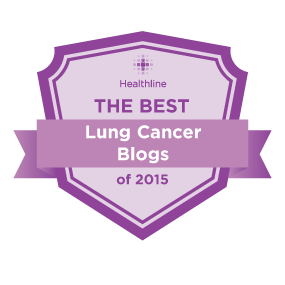 This has been a game changer in the world of NSCLC. Rather that using chemotherapy, which as Jason said is like a shock-and-awe campaign on the body, there are now a handful of drugs that are specifically designed to target a few driving mutations. Early on in my treatment, my oncologist tested my tumor sample for two common driver mutations with targeted drugs, EGFR and ALK. Sadly, I did not test positive for either. Over the next few weeks, as I gradually started to understand a bit more about this cancer, I learned that there are actually over a dozen known mutations, each that seem to correlate to certain population characteristics (smoking status, age, race). I went to my next appointment with my long list of possibilities and said that I wanted to be tested for all of them. Unfortunately, the sample that they had taken during my biopsy was too small to send off for this full battery of tests. Since the chemo was working, it made more sense to continue on and wait until my cancer started growing again to biopsy more tissue and test for mutations. But something kept nagging at the back of my mind. Fast forward to my sixth cycle of chemo. My oncologist was out of town, so I had a short visit with the nurse where she mentioned that I would be starting maintenance with avastin, or alimta, or alimta and avastin. I left feeling a bit unsettled and dove into researching maintenance therapy. And that nagging feeling came back. Then it dawned on me: there wasn't enough tissue left to test for a dozen mutations, but I bet there was enough to test for one. I emailed my oncologist and asked if we could test the sample for the ROS1 mutation. I had a hunch. Yes, the test came back and revealed that we have found what is driving my cancer. And even better, there is already an FDA approved drug to treat it, crizotinib, plus several others possibilities currently in clinical trials. This chart shows the breakdown of mutations in NSCLC. See that tiny little pink sliver at 1%? That's my tumor's mutation! This is pretty exciting news, as it opens up a whole new treatment path. I will be meeting with my oncologist on Tuesday to discuss starting crizotinib. I have heard that this drug comes with its own set of challenging side effects, and it can take weeks to months for your body to adjust to it. Most people say that once you settle in, it becomes more tolerable than chemo. Plus, it is administered in pill form, so I will get a break from IVs for a while! Most importantly, though, it means I have more options. I know that I will be dealing with cancer for the rest of my life, so the more tools I have to work with, the better. I keep reminding myself to temper my excitement, that there is always the chance that I will be in the minority for whom the targeted drug does not work, and cancer can eventually mutate again in response to treatment. For now, though, I am going to revel in my mutation. How amazing and exciting that you were able to zero in and test for the one rare mutation that you have! And that it opens up specific targeted options for treatment! Really, really amazing. I really hope the targeted treatment turns out to be a good fit and works well for you. - Kathryn. To be fair, it was the most likely based on my age etc, plus it was one that already has drugs available so my hunch was driven by hope as much as anything else. But yes, it was super exciting news! Thanks, I hope it works for me! I am so glad to read this post. Best wishes as you move forward with new treatments! Way to be a self-advocate and not let the medical industry own ALL the knowledge. You are amazing Tori! Amazing, what great news! I love the way you're coming at this. Armed with knowledge, you can advocate and get the doctors to actually LISTEN! Good luck. Greta news! All the best! Jenny - I am very excited to hear that students are learning about these new treatments. I hope that it won't be long before we can pinpoint the treatment to target each cancer. Erica! How great to hear from you! I have many treasured memories of our days together as kids. Thank you for your support, and I hope all is well with you! results. God speed to you! Thank you! I'm sorry to hear that your son is battling this too, but glad the Xalkori is working for him. The research is pretty exciting, indeed. Best of luck to your son. Amazing smarts and assertiveness. You made an educated, calculated guess, and convinced your doctors to act on it! I am sorry to read you are having a rough time of it with the side effects, and I'll be watching with great anticipation for your first scan results on crizotinib. Thank you, Beth! The side effects are much improved now, and I already have my fingers crossed for the January 31st scan!